I have been Coal Rolled..sort of. Well, it had to happen eventually, I’ve been “coal rolled”…well, sort of. The photos embedded within the story that follows are sad examples of “coal rolling,” a “practice of intentionally disabling the Clean Burn Programming of a computer controlled diesel engine, and/or installing a “defeat device” similar to the one Volkswagen illegally and secretly developed for millions of its vehicles. This device illegally allows the vehicle to emit an under-aspirated fuel-rich sooty exhaust that visibly pollutes the air. A few days ago I was driving my 2012 Nissan Leaf through the small town I call home when I pulled up to a traffic light to wait for it to change. After sitting silently in traffic for a moment I began to hear the unmistakable sound of an idling diesel engine growing louder to the left rear quarter of my Leaf. I glanced in my rear view only to see a large, raised, black, pick up truck with over-sized tires and a huge chrome exhaust pipe sticking out of the undercarriage in front of the right rear wheel (clearly he must have been compensating for something…). A red alert klaxon Captain James Kirk would be proud of went off in my head: COAL ROLLER! I rolled up the windows and set the climate control on recirculate to keep the inevitable black clouds of toxic carcinogenic diesel soot and ash out of my car’s cabin and out of my lungs. The light changed and I made a split second decision to take action and remove myself from the situation so I dropped out of Eco mode, actuated the accelerator firmly to the deck plate, and was silently, smoothly, and rapidly suctioned into the future leaving the quaking dinosaur-like diesel danger far behind in my clean, statically charged dust while grinning ear to ear the EV grin. I moved silently through traffic for a few moments and was unfortunately stopped behind a slow-moving old vehicular construct from the 1970’s and yet another traffic light. A few seconds later the gaudy environmental perpetrator idled up beside me rolling and rumbling slowly forward to get his behemoth of a truck in just the right position to angle his tailpipe in the direction of the front left corner of my Leaf. We sat there waiting for the light to change: in one lane a massive, towering, shaking Goliath of a vehicle that Mad Max would have been proud of. It was idling so roughly that I could see the entire truck vibrate with the controlled internal combustion chaos going on in the climate science and common sense denier modified, oil-soaked innards of its massive, Cummings turbo-diesel powerplant. In the other lane, I sat, like the proverbial David, in my tiny, silent, futuristic, 100% electric car. 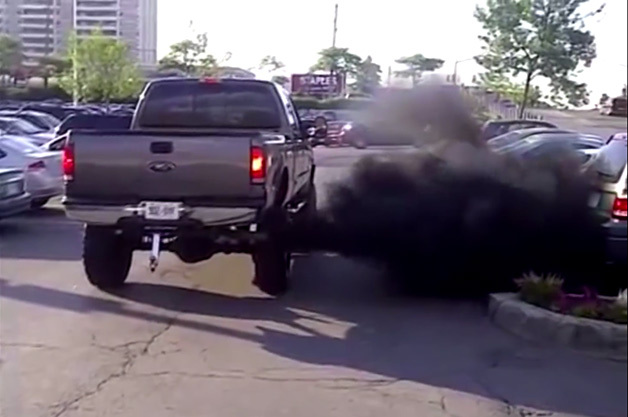 When the light changed Mr. Diesel dropped all the ancient dinosaur juice and testosterone filled spite he had into his illegally modified, anti-environment, fossil burning, ultra-conservative, big wheeled statement and out came…a tiny, rather insignificant, little puff of black smoke. I grinned -something had clearly gone wrong with his truck’s coal rolling modifications and with his attempt to drench my Leaf in billowing clouds of dirty black diesel smoke. I couldn’t stop grinning as he sped away thinking he had made some sort of an anti-green, anti-Obama, anti-environment, anti-EV, hateful statement. From my perspective, Mr. Diesel’s childish display of blowing smoke seemed to backfire on him miserably and for that, I am forever grateful. Did he learn a lesson from our encounter…highly doubtful. He probably returned home to boast and brag about his (failed) knuckle-dragging childishness to all his diesel soaked friends while posting stupid memes online likes the ones below. This was my first Coal Rolling experience since owning my Nissan Leaf so I decided that “retaliation” was in order so instead of flying off the handle and doing something as idiotic as the “coal rolling” infant by chasing him down and repeatedly stepping on the maggots face – I did some in-depth research on the topic and report on it below. According to many readily available articles: the “Coal Rolling” culture is a juvenile attempt to build up the egos of anti-environmentalists and toxically masculine often ultra-conservatives who feel that their “God-given freedoms” are being trodden upon. Many of these misguided individuals are afraid that the stricter pollution regulations imposed by the recent advances in technologies, the Obama administration, and common sense in general, may cause them to lose some of their access the ultra consumptive, garishly ignorant lifestyles they have become accustomed to. Another possibility is that with more and more people becoming more and more informed and conscious of the damaging realities of air pollution and the links between diesel exhaust and many forms of cancer, and the indisputable scientific facts and findings in support of anthropogenic global climate change being caused primarily by our daily actions of burning fossil fuels for energy, and with more people becoming aware of their own carbon footprints and their resulting impacts on the environment – and therefore many are now switching to hybrid and electric vehicles, tiny houses, renewable energy sources, dropping meat from their diets, and growing their own food–all of this common sense goodness could be yet another huge cause for concern for the Coal Rolling crowd. They see that their “kind”, their “people,” as a soon to be endangered species that are going the way of the very dinosaurs that power their toxic smoke belching giant wheeled phallically compensatory beasts so it is possible that their childish coal rolling displays are a visible way of rebelling against the inevitable change closing in from all sides. IMHO coal rollers are just grown up children throwing temper tantrums because they do not want to grow up and face the facts of life. 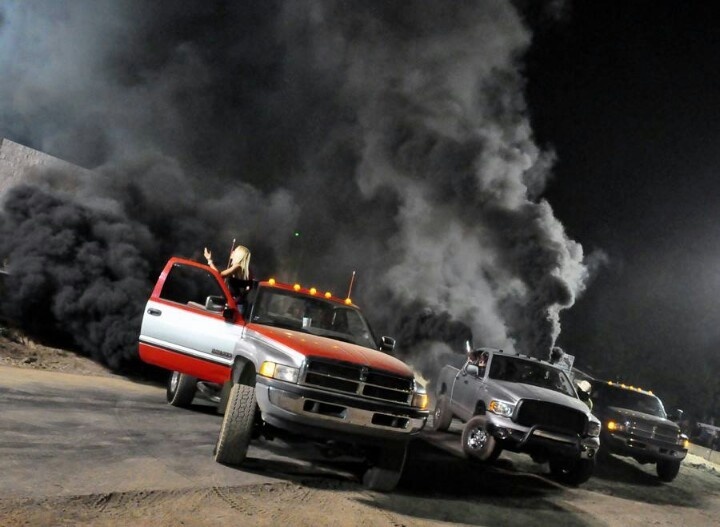 Whatever the juvenile and narcissistic reasons behind why they “roll coal,” what they are really doing are celebrating an act of the pre-meditated polluting of theirs and everyone else’s shared atmosphere. Coal rolling is a blatant disregard for the safety and health of the perpetrator, other drivers, pedestrians, wildlife and the environment and in every way, this practice should be illegal and banned everywhere. It is a violation of the [Clean Air Act] to manufacture, sell, or install a part for a motor vehicle that bypasses, defeats, or renders inoperative any emission control device. For example, computer software that alters diesel fuel injection timing is a defeat device. Defeat devices, which are often sold to enhance engine performance, work by disabling a vehicle’s emission controls, causing air pollution. As a result of EPA enforcement, some of the largest manufacturers of defeat devices have agreed to pay penalties and stop the sale of defeat devices. The CAA prohibits anyone from tampering with an emission control device on a motor vehicle by removing it or making it inoperable prior to or after the sale or delivery to the buyer. A vehicle’s emission control system is designed to limit emissions of harmful pollutants from vehicles or engines. EPA works with manufacturers to ensure that they design their components with tamper-proofing, addresses trade groups to educate mechanics about the importance of maintaining the emission control systems, and prosecutes cases where significant or imminent harm is occurring. So there you have it, the act of deliberately modifying your vehicle’s emission control system/engine to emit clouds of smoke is in fact illegal so if you are a coal roller you are intentionally breaking the law so it is time you face the facts – you and your garish disregard for others will soon go the way of the dinosaurs. If you drive an EV, Hybrid, bicycle, horse, or are just out for a stroll or run, keep your eyes and ears open for these small minded, backward thinking, environmental scofflaws full of toxic masculinity piloting their giant trucks because they target not only EV’s, hybrids and other small, fuel-efficient vehicles but also pedestrians, officers of the law, people of color, the LBGTQ community, and even the elderly. These “coal rolling” individuals clearly have serious and twisted mental issues and need some professional help. If you are “coal rolled” try your best to get a description of the vehicle, tag number, and report it to the police. If enough people report this insanity to the authorities, hopefully, the perpetrators will slowly become extinct like the dinosaurs they love to burn. If Coal Rollers continue to participate in toxic actions like this individual, they will quietly be weeded out of the gene pool by natural selection – and they should all win Darwin Awards for their ignorance. “I am not a violent person in any way. I think of myself as a gentle human being, a rational, thinking person who does not see violence or aggression as a way to fix anything. Today I witnessed an event that made me want to just grab the perpetrator and throttle them until they were a bloody pulp (although I would never have acted on my anger)! 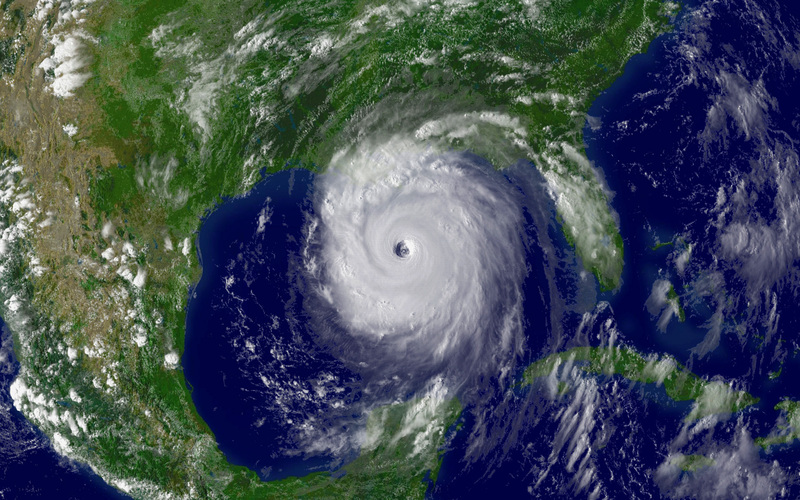 What did I witness that enraged me past the tipping point? Picture this. I was driving along in 25 mph heavy traffic and see on the opposite side of the road a female bicyclist that appeared to be in her mid-20s peddling the opposite direction on the sidewalk. Next, a large, raised, black pickup truck with huge tires and dark tinted windows pulls up alongside the cyclist, slows down, and, as I watched, a massive cloud of sooty, black diesel smoke billows out of the truck’s grossly-oversized-obviously-compensating-for-something exhaust orifice covering the cyclist with a cloud of toxic diesel exhaust along with the garish noise of ten thousand flatulent elephants!! The cyclist was coughing and waving her arm as she steered off of the sidewalk in obvious fear!! It was clear that the action was 100% intentional and directed at the cyclist. It was also obvious that the small-minded, infantile, knuckle dragging, coward had modified his childish toy truck to emit toxic clouds of thick, black, smoke on demand in order to attack innocent pedestrians so they can get his jollies in whatever childish, demented way that harming other people and our shared environment provides him with. The stupid toy truck and it’s cowardly inhabitants sped away as cowards always do and me, being logical and not reactionary, instead of chasing the slimy piece of maggot-ridden filth down and repeatedly stepping on his face – I promptly called the Highway Patrol and reported the incident. The officer stated that it was out of his jurisdiction however it could be considered some form of assault and should be called into 911 but in this case too much time had elapsed since the incident to do so. So f-ing frustrating!!! This may be a free country but we are not free to commit crimes such as this that are designed to target and harm others or our shared environment. 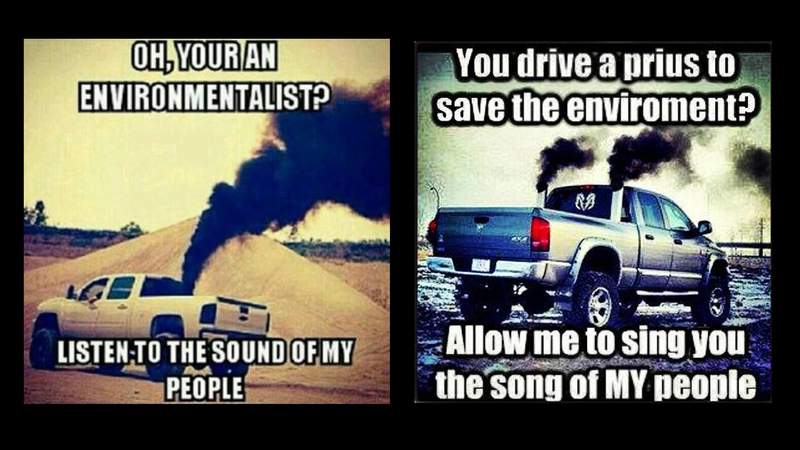 Nor are we free to tamper with the emission control systems on our vehicles for any reason and we are not free to commit these acts of stupidity that those that modify their vehicles to do so call “coal rolling” or “rolling coal”, – this is an absolute hateful premeditated attack on others and on the environment and it should not go unpunished! If you see this happen to try to get all the details including the license number if possible and then call 911, the sheriff, police, etc. And then there is my take on why Max was mad and the end of gas. So my friends the times they are a-changin’ and you can either choose to adapt and evolve with the rest of us, or you can stay the same, stagnate, and go the way of the dinosaurs that power your outdated old fossil powered machines. On a related and truly bizarre note, recently a Tesla EV owner was charging at a Tesla Supercharger in Hickory, NC and reported on Reddit that a group of men in large, modified pick-up trucks intentionally blocked access to the Tesla Superchargers and chanted “F” Tesla before being kicked out by an attendant – crazy! Below is a photo of the trucks blocking the chargers – note the two guys tinkering with their truck’s engine while the Tesla quielty charges – LOL. It is truly sad that by trying to make a difference in our lives, working to do good things for the environment, supporting American companies that provide thousands of jobs – those of us who drive Tesla’s and other EV’s are targeted by small-minded infants such as these charger blocking idiots and air polluting “coal rollers” who would rather act out in retaliation of the inevitable change rather than accept it and be a part of it. Imagine what would happen if EV drivers went around blocking gas/diesel pumps chanting hateful messages at Ford and Chevrolet owners – yikes. Obviously, we EV owners are a bit more intelligent than that.